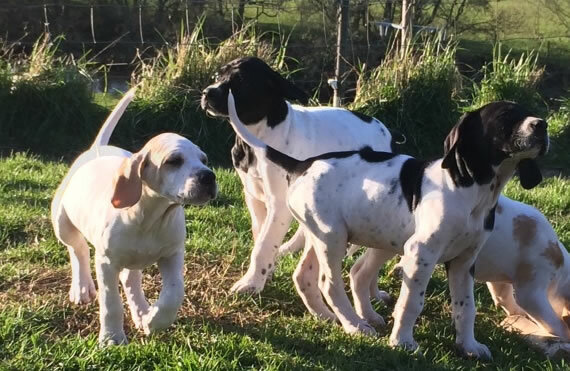 You might be suprised to learn that pointing dogs (Pointers, Irish setters and English setters) have been on the Game and Wildlife Conservation Trust payroll since the 1960s. They are essential in helping us conduct our grouse counts in the Uplands. 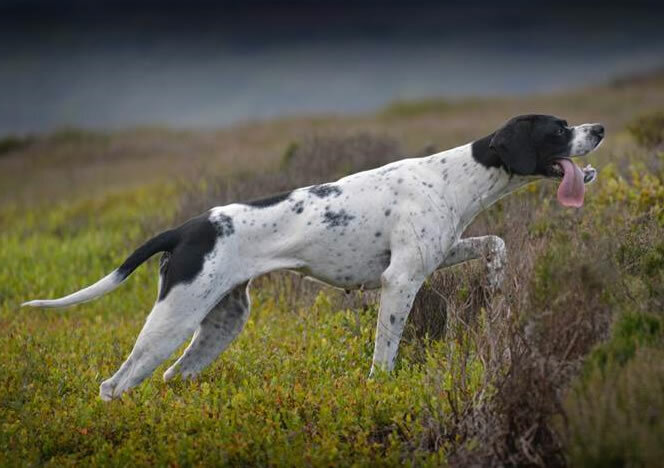 Pointing dogs are the group of working dogs which have been bred for generations to find game by air, scenting as they run across habitat which is likely to “hold” game. Records of pointing dogs being used to locate birds goes back to before the 1500s when dogs of a spaniel type were used to locate birds for falconry and for locating birds that were then netted on the ground to provide food for the lord’s table. So why do we use pointing breeds? By using pointing dogs to find the birds it allows the dogs to do the running about and hold the birds once found, allowing the field worker time to plod along behind but be very close to the birds as they flush, a spaniel or Labrador would flush the birds at some distance to the observer. Due to the nature of the habitat and terrain grouse numbers can't be assessed by observing the birds from vehicles driven along field edges. By harnessing the dog’s natural ability to locate birds hidden in cover and then freezing motionless on point we can accurately measure the numbers of grouse on a given area. Two major roles for the dogs include carrying out grouse counts in the spring when we use the dogs to allow us to estimate spring breeding densities and then in the summer when we can measure post breeding densities and productivity. However their role does not end there, the dogs are also used to locate and point incubating hen grouse, and for pointing chicks in the first two weeks of their life before they can fly. The woodland grouse workers even continue to use the dogs for one of the tasks they were originally bred for over 500 years ago. The dogs locate and point to black grouse and capercaillie where they are then caught in nets, but instead of ending up on the table they have high tech radio locating collars fitted, the old and new working together. The dogs are vital for our Uplands research and provide both pleasure and angst in varying amounts! Food and other small ongoing costs for each dog come to around £10 per week so we're trying to raise £10,000 which will cover the bills for 20 pointing dogs for a whole year.